It's no secret that I enjoy Christian fiction set a hundred or so years ago, particularly when it is taking place on the Plains or Rocky Mountains. 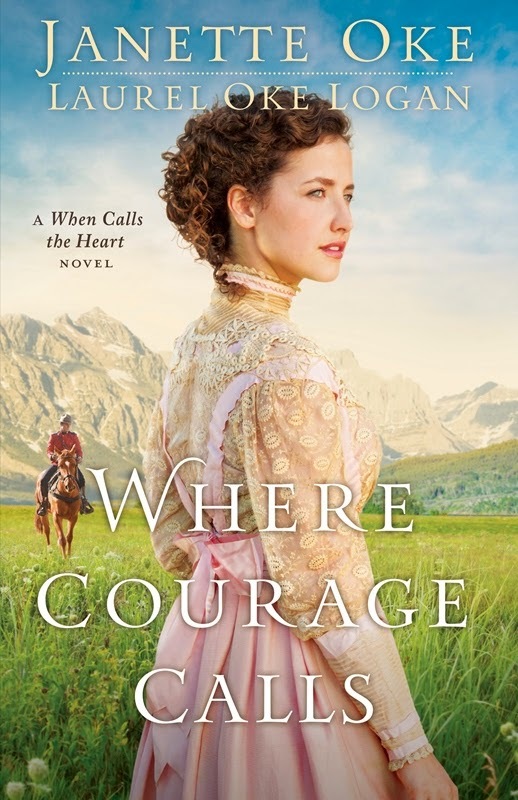 So Where Courage Calls by Janette Oke and Laurel Oke Logan was right up my alley. This story takes place in the Rocky Mountains -- in Canada. The story starts in Toronto, as Beth is having a farewell party hosted by her mother, before she heads out west to teach school. Her courage and her heart will be tested in ways she never expected . . .
My thoughts: This was an enjoyable book to read. The characters were complex, and everyone seemed to grow in the course of the school year that the novel covers. There were so many folks in this story that I really cared about -- Beth, of course. But also the widowed mothers of her students who are struggling so much to provide something better for their children. This sounds wrong, but with my work at the food pantry out here in a rural (but not nearly as poverty-stricken) Southern Rocky Mountain region, I couldn't help but picture some of the women I've met through the pantry as I read this novel. The town where Beth is teaching is in need of so much more than just some readin' 'ritin' and 'rithmetic -- there are hungry children, impossible-to-pay medical bills, distrust, prejudice -- in short, a society not all that different from ours today. I was told in food pantry today that some families are scared to come in to get food, even though they need it and even though they have a green card, because they are afraid that asking for help will get them into trouble. I found myself thinking of them as I read about the Italian miners in the story. In short, even though this takes place sometime in the 1920's, so very much of it rings true to life today. I want to be more like Beth, reaching out and bringing people hope, bringing people together. Reading this book has already changed me. Oh, boy! I LOVE Janette Oke!! This sounds awesome!